For $7,700, Could This 1993 Mercedes 300CE Be Your Summer Fling? Today’s Nice Price or Crack Pipe Mercedes 300 CE is a car you might have forgotten ever existed. We’ll decide if this drop-top Benz has a price worth remembering. Polishpolishpolish… nope, still a turd… POLISHPOLISHPOLISH… ACK, STILL A TURD! Therein encapsulates the general opinion of yesterday’s 1994 Saleen Explorer XP8. As you might expect, its price didn’t fare any better, as no one really wants an old Explorer no matter how tarted up or whose name covers it. That resulted in a 75-percent Crack Pipe loss which undoubtedly set off Steve Saleen’s spidey senses wherever he is. Sure, having to maintain that Saleen Explorer would likely be an exercise in futility, especially as age and desire shifts many of its unique parts from expensive to unobtainable, but honestly who’s got the time? I mean, summer is just around the corner and what would you rather be doing when there’s fun in the sun to be had; hunting down drive belts and brake pads, or rolling like you’re Tom Cruise in this 1993 Mercedes Benz 300CE? The W124 Cabriolet debuted at the 1991 Frankfort Auto Show, rounding out a model line that already included a sedan, estate and coupé. Remarkably, these cars were Mercedes’ first four-place convertible since the 1971 280SE. They were heavily re-engineered for convertible duty with substantially strengthened floors, door pillars and windshield frames. Contemporary tests lauded them for their imperturbability. Okay, I know what you’re thinking… they made a convertible W124? Yeah, you don’t see these much at all, and unless your hobby is quoting The Firm verbatim then probably don’t remember the 300CE being featured in that film. Fun fact, in the John Grisham book, the car’s a BMW. 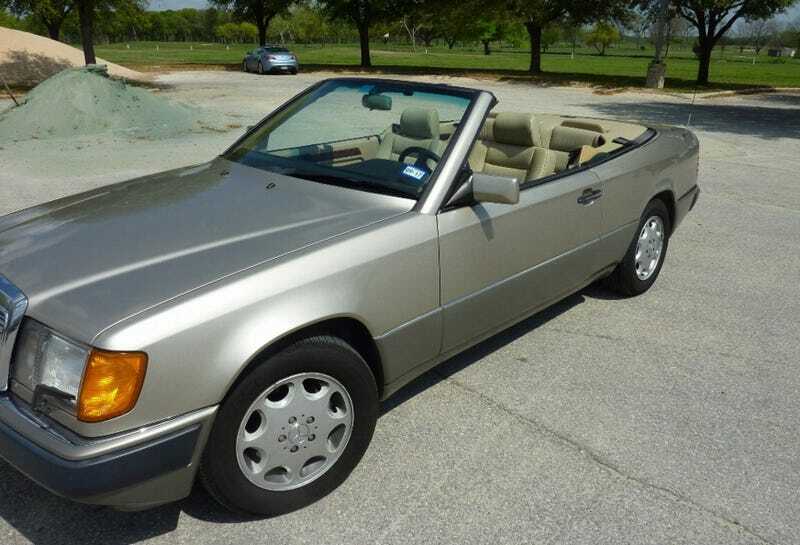 That all makes this 1993 Mercedes 300CE convertible an intriguing proposition. It’s also interesting because it’s at the low end of the pricing spectrum for these cars which typically happen to ask about four-times what a similar condition coupé might go for. The car is gold over biscuit and rocks 140,000 miles on the clock. Its seller says he bought it a year ago at 132K and has since replaced the battery, some hoses and the top liner along with racking up the 8K in miles. Underhood lies a 217-bhp 24v DOHC straight six, and coupled to that is a four-speed Benz-o-matic. As a matter of fact, pretty much everything on his car is power assisted—windows, mirrors, seat adjusters, and the top, which is also described as fairly new. These cars were about eighty-five grand when the whole thing new and Mercedes outfitted them accordingly. Wheels are the factory eight-slots, and it’s claimed to have new-ish Michelins all the way around. Paint seems very serviceable, and the car appears straight and free of any noticeable dings, chips, or dents. Is it all Tom Cruise and tax cases however? No, there’s apparently some age-related wear showing on the burlwood inside, and the oil pressure gauge seems to have given out. The seller says it needs a sensor, but if that was all it needed you’d think he’d have had that fixed by now. Last thing, the radio aerial took a little blue pill and its been more than four-hours… it won’t go down. None of those issues should be deal killers however, and the price tag might just make them fade from consideration. That price is $7,700 which if you check around is just a little more than half of what many 300CEs are asking. The car has been on offer for a while and has come down from $7,900 so there may be more to the story than the limited AutoTrader spiel lets on. Regardless, we’ll still have to judge the car based on the merits of that ad and its presentation. With that in mind, what’s your vote on this ’93 Convertible and that $7,700 price? Does that seem like a deal to get a cool summer ride? Or, does that price make this Benz instantly forgettable? Auto Trader out of Austin TX, or go here if the ad disappears.